A large complex with fantastic facilities, Hotel Fuerte Marbella is ideal for both couples and families wanting to enjoy a relaxing break close to the heart of Marbella. Choose from excellent facilities onsite, including a spa and four restaurants and bars or head into cosmopolitan Marbella. Here you’ll find chic bars, family run tavernas, upmarket dining, fantastic shopping and lots more. Holidays at the Hotel Fuerte Marbella are perfect for lazy days spent soaking up the sun on the sandy beach or next to one of the two swimming pools. Head to the spa for a full day of pampering while your little ones make new friends at the club or enjoy excursions. Hotel child prices apply to ages 2–12 years. The hotel has 263 rooms, 6 floors, and 4 lifts. Specially modified rooms for people with reduced mobility are available on request. 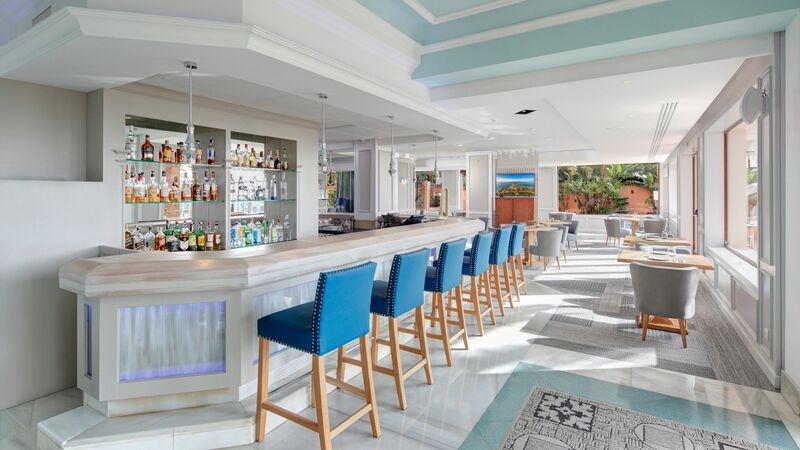 The Noble Bar is a great place to relax with a cocktail with wonderful sea views, live music and shows. 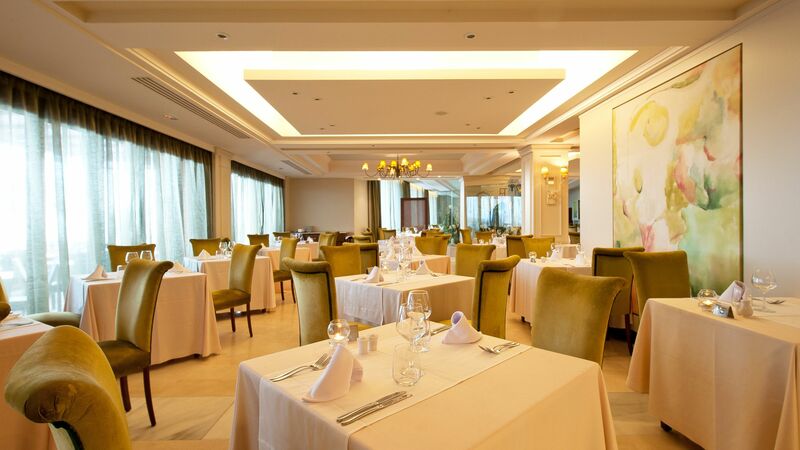 Open for breakfast and dinner, the buffet restaurant serves a wide selection of international cuisine. It is also open for lunch in July and August. 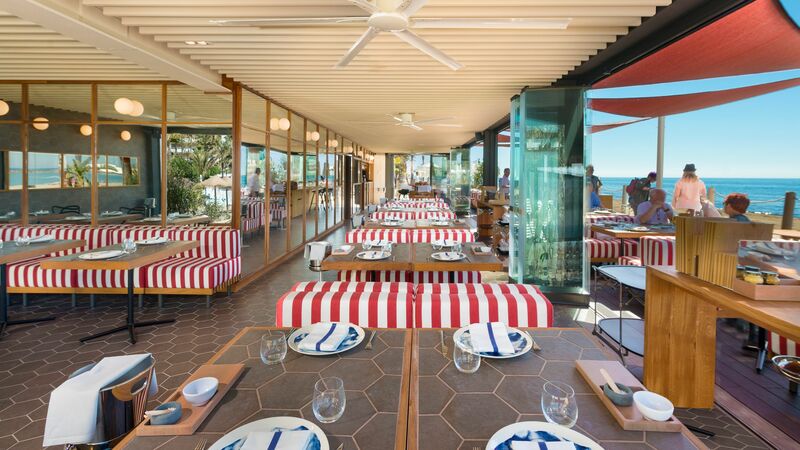 Located by the sea, Beach Club Soleo Marbella offers an à la carte menu of Mediterranean classics. The hotel has two swimming pools, one of which is heated and covered in winter. 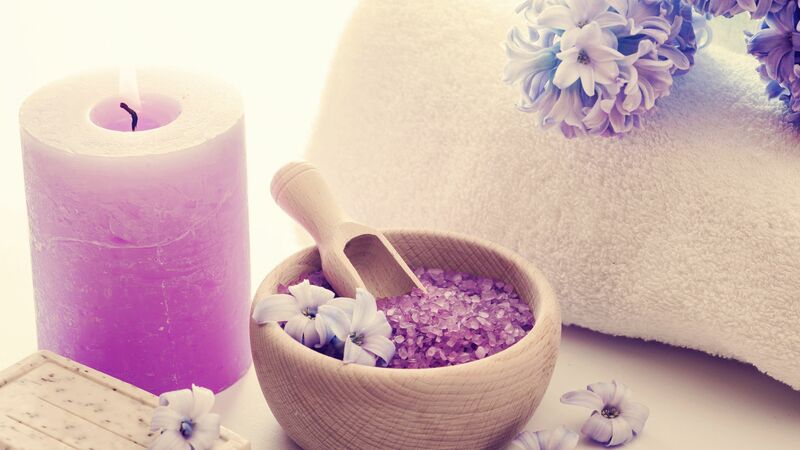 Spa facilities are available at the hotel's sister property, located 300m away. 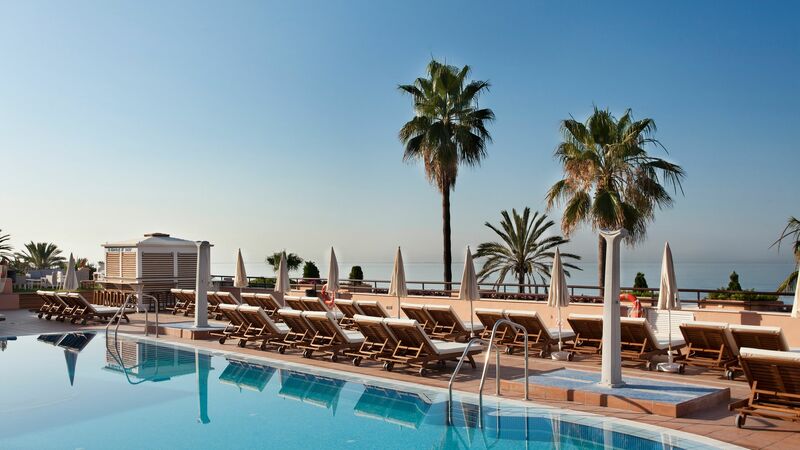 Located in the heart of cosmopolitan Marbella, and close to its golden sandy beach, Hotel Fuerte Marbella enjoys an ideal position on Spain’s south coast. Families will love spending their days on the Blue Flag beach, with its clean sands and family friendly amenities, including restaurants, showers and water sports. People watching is excellent here, with glitzy restaurants along the Golden Mile seafront where you can enjoy al fresco refreshments, drinks and snacks. Culture lovers can explore Marbella’s old town, which dates back to the 10th Century and offers Moorish and European architecture. Wander through its cobbled streets and quiet little squares, admiring the architecture and churches. This is the ideal place to try some traditional Spanish dishes and locally produced wines. Hotel Fuerte Marbella is a 45 minute drive from Malaga Airport. Classic Double Rooms have a double bed or twin beds, air conditioning, satellite TV, internet access, minibar, safe, pillow menu, hairdryer and shower or bathtub with overhead shower. These rooms face the street or the entrance of the hotel. Double Side Sea View rooms have a double bed or twin beds, air conditioning, satellite TV, internet access, minibar, safe, pillow menu, hairdryer and shower or bathtub with overhead shower. For your own safety, please ensure that you take care when on the balcony and do not lean on or over the railings. If you have children below the age of 12 in your party, please ensure they are supervised and not left unattended at any time. Double Sea View rooms have a double bed or twin beds, air conditioning, satellite TV, internet access, minibar, safe, pillow menu, hairdryer and shower or bathtub with overhead shower. For your own safety, please ensure that you take care when on the balcony and do not lean on or over the railings. If you have children below the age of 12 in your party, please ensure they are supervised and not left unattended at any time. Single Rooms feature air conditioning, satellite TV, internet access, minibar, safe, pillow menu, hairdryer and shower or bathtub with overhead shower. These rooms face the street or the entrance of the hotel. Save up to 10% on the hotel price for holidays between 01 October - 05 November 2019 booked by 25 April 2019. Guests who stay a minimum of 28 nights will receive 20% discount on the hotel price for holidays with stays until 11 April 2019. I liked the look of this hotel and its location so chose it for one week in April. I let them know it was our Wedding Anniversary whilst we were there and got an immediate response from Rosanna who is their travel expert as well as receptionist. She came back with a raft of ideas and suggestions including wine in the room, breakfast in the Beach Club and flowers. This help continued even when the weather took a nosedive. We visited Honda, which was just beautiful and Puerto Banus when clouds were the order of the day. Rosanna and her fellow staff colleagues could not have been more helpful and professional throughout our stay. Hotel itself was clean and all staff were just as kind and helpful. Would recommend and definitely will go back. Must recommend Mariscal restaurant just in the Old Town (on Delores, just North East of Orange Square). Food and service exceptional and about 8pm the staff do a medley of Opera and modern music. Great voices. Absolutely Fabulous. We have a golden rule - never go to the same place twice. Well this hotel breaks that rule - i?? ?m coming back!!! From start to finish it?? ?s a great hotel, staff are amazing, every single one of them. Best service. Spoilt. Treated like royalty, blown away by their pride in their job and the standards throughout the hotel. As a Travel agent I normally don't do reviews but this hotel deserves it. This was my idea of Paradise for a few days with my Partner. Excellent Location, Picture perfect Views and beautiful grounds Make this and Extra Special hotel. All Staff Members very Helpful and Friendly and give a High Level of Customer Service. Interior & Exterior of the Hotel has beautiful seating areas and the Food throughout is Fantastic you would be spoilt for Choice. Location with Beach to the back with a beautiful Promenade and to the front you are only a few minutes walk to the Old Town of Marbella. Our Room was amazing with Fabulous views and would definitely recommend you pay the extra and go for full Sea View. I can't recommend Highly enough 5*. We can't wait to go back. This hotel is in an excellent location with fabulous views. The food, service and facilities were super. Every member of staff was pleasant and helpful, particularly to our youngest son. I have not written a review on trip advisor before but he wanted me to on this occasion so that I could rate the hotel as five stars. I had problems with noise travelling through an interconnecting door on our first night and so mentioned it to reception the following morning. They moved us immediately and without hesitation. The gardens and swimming areas are beautiful and I particularly liked the policy of not allowing people to reserve sun beds, which takes the pressure off trying to find a sunbed before you have even had your breakfast. If I wanted to find fault, the only thing I would add would be that I couldn?? ?t find any electric charging sockets near to the beds, but this is hardly a major issue. We travelled as a family of 11 and all enjoyed our stay. The wife and I stayed at this location during the second week of March. The weather was great and the view from our room even better. Take the upgade to a partial or full sea view (falling asleep to the waves is amazing). The pool is covered during this time of year, but it was more than adequate. We only had the included breakfast buffet at rhe hotel but it was also satisfying. Only issue, service for the buffet starts around 7:30am or so. Room was clean (even provided toothbrushes and toothpaste) and staff was very friendly, elevators are small compared to American hotels. Beach out front was nice and sandy and there is a promenade full of shops and cafes.